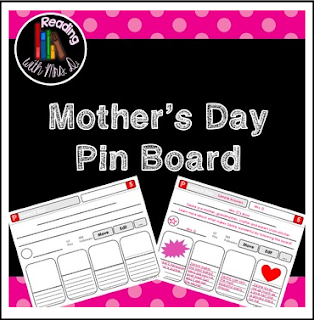 If your students mothers are anything like me, they LOVE using "Pinterest" to save their online ideas. Why not take the pin board idea and have your students pin some of their favourite things about their moms? Simply download this Freebie and follow along my sample answer page to have students fill in each section. You can of course modify for your class and what you are learning now. Also, why not file this page away in your records as a possible literacy response activity for a book you're reading?